While hunting down examples of beautiful PS3 box art for this blog post late last week, I came across the following handful of similarly appealing Japanese 3DS covers and decided to conjure up a post about them as well. The first, below, is of Spike Cunsoft's oddly named (and just as oddly themed--as it has players explore demon-infested dungeons with their illegitimate spawn, er, "Star Children" in tow) Conception II: Guidance of Seven Stars and Muzzle’s Nightmare. Odd as it may be, Conception II's cover art looks pretty great--thanks in large part to its use of bright blues, purples and magentas. The design created for New Etrian Odyssey: Millennium Girl's packaging, below, is on the opposite end of the spectrum in terms of both color and drama, but that doesn't mean I find it boring. On the contrary, I find it to be completely compelling. Strange as it probably seems, I'm particularly taken with the font that makes up its logo--a perfect complement, in my opinion, to the ethereal illustration that supports it. Mario and Luigi RPG 4's box art, below, also keeps things simple, and benefits greatly from it. The only thing I'd change: that bat-thing that's hovering just above Mario's head. It really isn't needed. Thankfully, it hardly destroys the rest of the design, so I won't be too disappointed if it appears on the game's North American cover, too. I have a feeling I'm going to be in the minority when it comes to liking Monster Hunter 4's box art, below, but I don't care. Of course, I've long had a soft spot for the kind of illustrations that graced covers of North American Genesis games--which Monster Hunter 4's art harkens back to, even if unintentionally--so you might want to take my opinion with a large grain of salt. What do all of you think about the box arts above? Do you love them? Hate them? Don't worry, a shrug of the shoulders is an acceptable response, too. I love it, too, Justin. Really, companies should take the "tranquil box art" route more often than they currently do, if you ask me. Millenium Girl is my favourite out of those, Monster Hunter 4's is OK (and fits in with most of the other cover art in the series) but nothing more. Millenium Girl is really pretty and makes me glad I bought it, even if I can't play it right away (not enough time with Eschatology coming out on the same day... and SMT4 keeping me busy). Yeah, I wouldn't say MH4's is amazing or anything, but I do like it. And Millenium Girl's is great. Really hope it's used when it's released here in the States (assuming it is released here, of course). Oh, yes, Millennium Girl's is great, no question. I like SMT IV's quite a bit, too, by the way. Do you agree? Yep, I also like the SMT4 cover... It does give away which character represents Law and which represents Chaos, but if the cover didn't tell me I would've been able to guess from the first few hours of the game anyway. I like the way it plays with the colors, really well done. 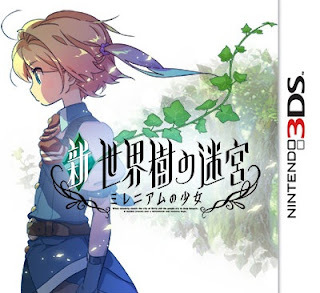 I hate to be the lone detractor, but I'm really not a fan of the box art for the new Etrian Odyssey. I don't think the game's character design is interesting enough to be almost the sole use of space, and that particular art style doesn't translate well to profiles. The other box arts are nice. Hey, you're allowed to have an opposing opinion here, Matt. That said, I think the Millennium Girl box art at least deserves a bit of praise for doing something different for the series. Pretty much every other Etrian Odyssey cover features a group shot of three or four of the game's characters. Boring! BTW, my favorite piece of Etrian Odyssey box art is the one created for the North American version of the first game. It reminds me of a storybook, for some reason. These are all pretty nice covers, but out of all of them I like Conception II's the best, the use of color is really great and you already know I like "character piles," but I think this one's better composed than most. I'm not wild about the MH4 cover but of the Monster Hunter boxes you've featured before I think I like this one best, it's got a bit of that western influence you mentioned, and there's a cool sort of symmetry/asymmetry with the two characters in conflict. I wish the player character were looking right at the monster though. (Maybe that was a little too typical?) What's he looking at? Hey there, Michael! Yeah, I agree that the Conception II box art is really nice thanks to its use of color, especially. You don't see such colors used very often in games, period, let alone in game box art. As for MH4's box art: actually, I think the player character *is* looking at the monster. It's just that the perspective is skewed, I think. In my mind, he's on the monster's back and is looking at its gaping mouth, which is quite a bit in front of him. I may be wrong, though. Regardless, I agree with you that Monster Hunter box art, in general, is far from amazing. I personally think it sets a certain tone, though, and that's enough for me. It's certainly different, and it's not even necessarily that I think it's bad, just unremarkable. For better or worse, it looks more apropos of a dating sim than the sort of game Etrian Odyssey actually is. I like the first cover too! I wish Atlus stuck with the box art style of the first two games--EO4's box art is mediocre, and I don't understand the RPG box art trend of shoving all of the (fairly similar looking) characters on the front. Conception II at least has a nice composition and color scheme. I totally agree with you that Millennium Girl's box art makes it look like a dating sim. Of course, that's part of the reason I like it (even though I know it's faaaaaaar from a dating sim, of course!). I'm also a bit sick of the "shove a bunch of characters onto the cover art" trend infecting JRPGs, especially. Let's try something different, shall we? I kinda want to play Conception II for it's ridiculous premise of having babies and then sending them out to fight. As for the MH4 box art I find OK, nothing too amazing but it gives a good idea of what the game is about. I can see Capcom replacing the art for NA/EUR with something that'll match the white case they'll be using in NA/EUR better like they did with MH3U ( though I don't know if they actually changed the box art because of the white case). Ah, now I see it. I guess I'm looking for more of a 2D view, even if it doesn't really "work" in the perspective they've set here. Oh well! And yep, it does have a certain tone to it, I like that as well. You know what I would find interesting? A MH cover that pulls the view back quite a bit and really gives you a view of one of the grand play areas--maybe with a gigantic monster in the background? Not sure how that would work in practice, though. Ah, that doesn't surprise me much--that Luigi's "snot bubble" (ha!) has been removed. I can't say I like the NA version of this game's box art, by the way. The logo is just too heavy, IMO. 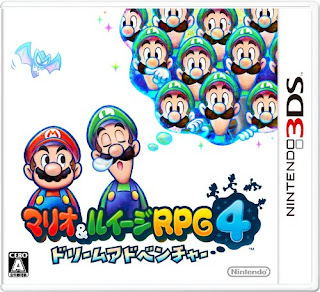 Also, I kind of wish Nintendo had left this series as Mario & Luigi RPG the world over. Oh, well! Yeah, I'm curious about Conception II, too. I wonder if it'll be localized? I highly doubt it, but you never know. 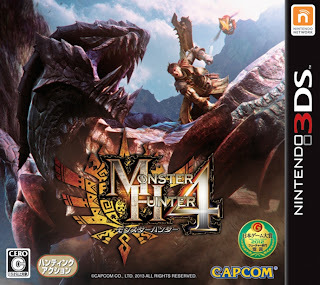 And, yes, I expect MH4's box art to be changed, too, although I'm not sure why Capcom does that, to tell you the truth, as most MH cover images seem very western-friendly to me. That would be cool! What really surprises me is how the covers don't seem to play up the multiplayer aspect at all, when you suggested pulling back the camera I thought we'd see the whole monster, and then maybe see a whole group of heroes charging in at different distances. That would show the scope of the subject matter and still have at least one or two player characters pretty well visible. They kept MH3(tri)'s box art the same in NA but they did make the word tri bigger. 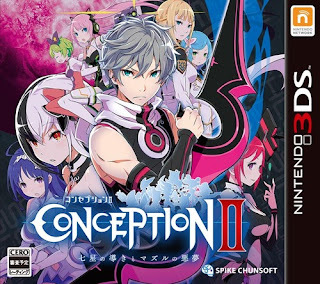 That Conception II cover is beautiful. Never even heard of the game until now, but I'll have to look into it just because! Weejee in full cute mode! !